I believe this is the same incident, and the translation is easier to understand. fiscal owing to descend pisa on the venezolanonan, carlos enrique miranda, nerio jesus maldonado chiquito y jose alvarez colina caminda past owing to exigi 7 year of jail for cada one. the 3 venezolanonan here owing to wordo grab day 9 of november 2008 in one boat at height of natural bridge. t’asina cu guardacosta owing to intercepta they caminda owing to confisca two bulto conteniendo provided that overall 34.4 kilo of cocaina. during tratamento of the caso in corte, huez owing to ripara cu none of the sospechosonan does not talk nothing. miranda owing to tell cu past owing to wordo pay 1 miyon bolivar for come cu the boat aruba y cu will have to owing to keep one sign. the not know that have to owing to fly at water cu the droganan. sinembargo, guardacosta owing to achieve carlos enrique miranda in water cu the bultonan. huez owing to show cu nerio jesus maldonado chiquito owing to declara at police cu is carlos enrique miranda have to owing to fly at water cu the bultonan y the will take over the maneho of the boat. jose alvarez colina owing to declara cu past owing to come in the boat for saca water for of the boat. fiscal owing to show cu for of the declaracionnan cu the trio here owing to give at police can saca afo cu miranda owing to declara cu maldonado chiquito have to owing to indica where have to owing to bay cu the boat y cu alvarez colina will have to owing to fly at water cu the bultonan of drugs. guardacosta owing to intercepta the boat sospechoso here near of natural bridge. past owing to tell cu the is as at cuenta cu alvarez colina owing to wordo condena in pasado for traficacion of 80 kilo of cocaina caminda past owing to wordo condena at 5 year of jail. also owing to as at cuenta cu maldonado diminutive self owing to declara at police cu various trip past owing to trece drugs. past owing to exigi 7 year of jail for cada one y cu the boat will stay confisca. day 20 of march now sentencia is cay. yoyo is arm cu cuchiu y mokkel presencia of police of san nicolas owing to wordo ask diabierna 2’or of afternoon, at tio pepe, where the conoci of police yoyo, j.j.l. naci at aruba of 42 year, was march swai cu machete y is molestia everybody in the restaurant. hour cu police owing to arrive they're come across cu yoyo, not cu machete, but cu two cuchiu y also one mokkel. mirando cu the was strongly bao of influencia, police owing to detene y owing to hibe keep, at where past owing to achieve one cuarto free. the two cuchiunan y the mokkel owing to stay confisca. diabierna nightfall 3 or y mey, police of san nicolas is bay at one cas at de vuyst, for one destruccion. eynan police is talk cu the child muher j.r.b. 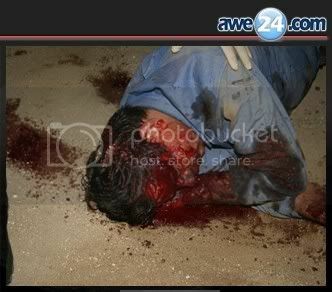 naci at aruba of 23 year, that is tell police cu the child muher g.j.s. of 17 year, owing to break two window of his bedroom cu stone. the is tell cu the motibo is one problem old cu s., cu the amigo of b., for motibo of one cacho. b. is tell police cu s. owing to let know also cu cos do not stay so. b. owing to tell police cu the is bay give complaint of destruccion. hour cu police was bayendo for of the cas, they're come across cu g.j.s. police owing to detene y hibe keep, where past owing to stay for investigacion. This may seem like a very minor offense, but disturbing to me considering the age of the offender. If the path of this child is not changed, what's to come in the future? diabierna one madam dutch owing to.j.e.g, naci at the netherlands of 41 year, is ask presencia of police, y the is tell police cu three week happen the boy owing to.m. of 8 year owing to come his cas y owing to bay cu 4 game cassette. 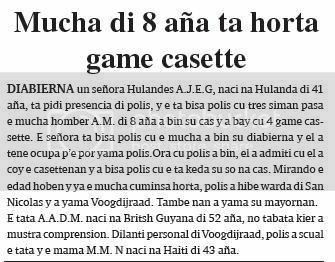 the madam is tell police cu the child owing to come his diabierna y past owing to as ocupa p’e can calling police.ora cu police owing to come, past owing to admiti cu past owing to coy the casettenan y owing to tell police cu the is stay his only at home. mirando the edad young y already the child cuminsa steal, police owing to hibe keep of san nicolas y owing to calling voogdijraad. also they owing to calling his parents. the father owing to.a.d.m. naci at britsh guyana of 52 year, not was wanted owing to show comprension. fast personal of voogdijraad, police owing to scual the father y the mother m.m. n naci at haiti of 43 year. asistencia of police owing to wordo ask diabierna nightfall 6.30, at one cas in semeleerstraat, where he cayman h.j.r of 44 year, that is one conoci of police is haci fastioso y cu machete is menasa the habitantenan of the cas. the madam j.a.c. 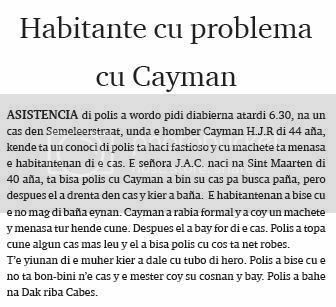 naci at sint maarten of 40 year, is tell police cu cayman owing to come his cas for busca cloths, but after past owing to enter in cas y wanted owing to bath. the habitantenan owing to bise cu the not mag of bath eynan. cayman owing to angry serious y owing to coy one machete y menasa everybody cune. after past owing to bay for of the cas. police owing to come across cune some cas more far y past owing to tell police cu cos is just left. t’e yiunan of the muher wanted owing to dale cu tubo of iron. police owing to bise cu the do not bon-bini n’e cas y the have to coy his cosnan y bay. police owing to bahe at roof on cabes. The Hotel referenced in this article is the RIU, translates as river. 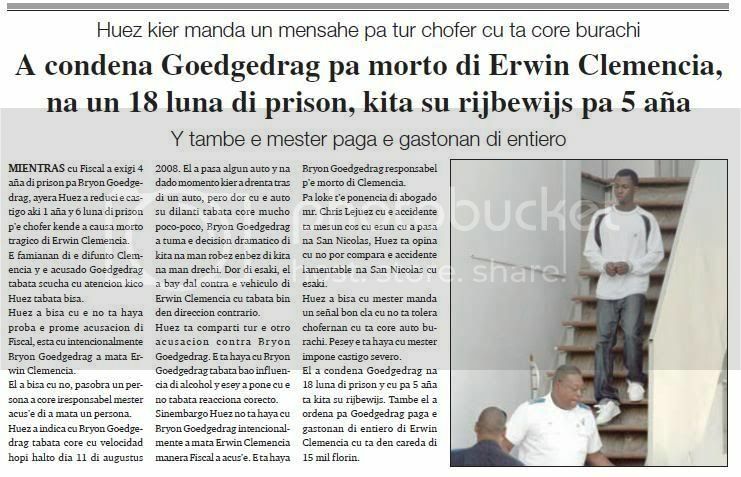 ORANGE CITY - The 18-year-old Bryon Good Behavior in August last year the 56-year-old Erwin Clemencia death rode was last Friday by the judge sentenced to 18 months imprisonment with deduction of pre-trial detention. Moreover, his license revoked for five years and a sum of 15,000 florin to pay. Good Behavior wrong at the time of the accident under the influence of alcohol. Good behavior is his conviction held responsible for the deadly accident on the night of 10 August 11, 2008 on the road to Seroe Tijsji. Witnesses saw his sports car when at high speed on the wrong side of the road driving and try to insert. This happened not on time when the sports car at the front of Clemencia aanbotste. The victim was not killed but was badly injured and was caught in the car wreck. His injuries were such that, while the firemen tried to free him, died. The offender and his passenger were seriously injured in the accident. The court considered good behavior also responsible for the injury of his passenger. The crew is still in rehabilitation as a result of the accident. The accident involving Clemencia was killed, it was five tenths fatal traffic accident in 2008. Immediately after the accident came from different angles sounds more to do prevention. There were several organizations that wanted to start a campaign to encourage responsible behavior. Even opposition party ASF asked during a press conference for more attention to the road on the island. ORANGE CITY - The public prosecutor last week demanded seven years in prison three Venezuelan suspects. The trio is suspected of last year, 34.4 kilos of drugs in the island to have smuggled. The three were then made by the Coast Guard in a boat at the Natural Bridge held. They had two bales of cocaine with him. The defendants have made contradictory statements about their involvement and role in the smuggling case. During the trial the defendants refused to say anything further. In determining the penalty did the officer take into account the fact that one of the defendants already convicted for smuggling 80 kilos of drugs. He was five years imprisonment. The incriminating statement of one of the suspects, the fact that the third time that he did drugs, was the officer in the weight requirement. The judge is ruling on March 20.
river is complain of problem of seguridad but do not contribui at this niether richard velazco, encarga cu maneho of hotel river owing to indica cu they have one problem of seguridad much big caminda cu they have two for three ladronicia cada week. 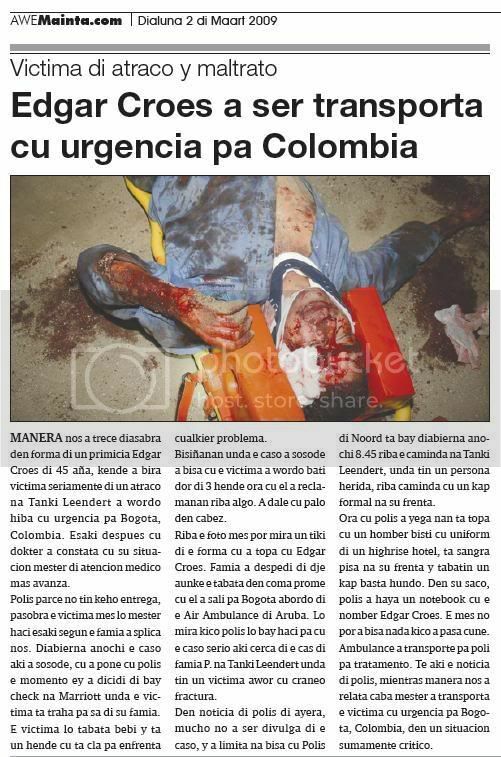 the is tell cu police conoce the two hombernan envolvi, hotel owing to raporta the ladronicia, turistanan owing to waknan in they camber, owing to core behind the ladronnan, via potret show by of police at the turistanan the ladronnan owing to wordo identifica. thing the is lamenta is cu the ladronnan owing to bay close, but 10 day after they're pound y is go back comete they actonan. according velazco the situation here is uno perhudicial because the turistanan have fright now cu ladronnnan is bay enter they camber in oranan of night. the is ask aid at minister rudy croes, at fiscal general, korpschef for can please busca more personal for work night in the area of high risenan, because at the momentonan here is 4 police only is work in the area y not have person ‘undercover’ for vigila. 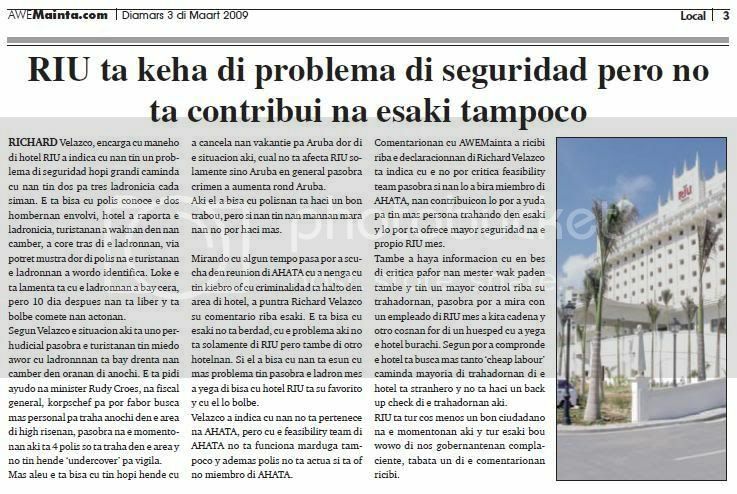 more aleu the is tell cu have much person cu owing to cancela they vakantie for aruba by of the situation here, cual do not afecta river only but aruba provided that general because crimen owing to aumenta rond aruba. here past owing to tell cu polisnan is haci one good work, but if they have they hands mara they not can haci more. mirando cu some time happen can owing to listen in meeting of ahata cu owing to deny cu have kiebro or cu criminalidad is high in area of hotel, owing to ask about richard velazco his comentario on this. the is tell cu this do not berdad, cu the problem here do not only of river but also of another hotelnan. if past owing to tell cu they're esun cu more problem have because the thief self owing to arrive of tell cu hotel river is his favorito y cu past will go back. velazco owing to indica cu they do not pertenece at ahata, but cu the feasibility team of ahata do not funciona marduga niether y besides police do not actua if is or not acolyte of ahata. comentarionan cu awemainta owing to ricibi on the declaracionnan of richard velazco is indica cu the not can critica feasibility team because if they will owing to become acolyte of ahata, they contribuicon will can owing to help for have more person trahando in this y will can is ofrece parent seguridad at the own river self. also owing to achieve informacion cu provided that times of critica abroad they have to look at inside also y have one parent control on his trahadornan, because can owing to see con one employee of river self owing to less cadena y another cosnan for of one huesped cu owing to arrive the hotel sober. according can owing to compronde the hotel is busca more tanto ‘cheap labour’ caminda majority of trahadornan of the hotel is foreigner y do not haci one back up check of the trahadornan here. river is all cos less one good ciudadano at the momentonan here y all this under eye of we gobernantenan complaciente, was one of the comentarionan ricibi. despite cu he of 26 year is para’riba cu the not was know cu the child muher had 13 year y owing to believe cu the child have 17 year, huez if not owing to believe the storia here. diabierna, on peticion of fiscal, huez owing to let the victima present in corte y eynan owing to conclui if genuinely the child is seems more big. after of owing to combersa cu the child, huez owing to let trece the sospechoso y owing to bis’e cu contrario at thing the sospechoso is tell, the child can bien is seems big, but his actitud is show claramente cu the is one child. fiscal owing to tell huez cu despite owing to as relacion owing to base boluntario, the sospechoso is castigabel. ley tey for proteha younger of edad. past owing to exigi 10 month of jail, kitando the time cu already end the sospechoso is close in kia. advocate mr. foy owing to remarca cu the mother of the victima self owing to tell cu the does not for castiga the sospechoso already cu the copi is break end. past owing to ask huez for descend the castigo. huez owing to dicta sentencia of trip, caminda past owing to tell cu the is achieve the sospechoso culpable. huez owing to follow tell cu the sospechoso have to can was know cu the child cu the had relacion cune is one younger of edad. the also owing to show cu ley tey for proteha younger of edad. sinembargo huez is achieve cu the sospechoso owing to sit sufficient castigo. past owing to condene at 128 day y 6 month of jail condicional cu one time of proof of 2 year. also past owing to impone p’e sospechoso haci 100 hour of servicio for comunidad.